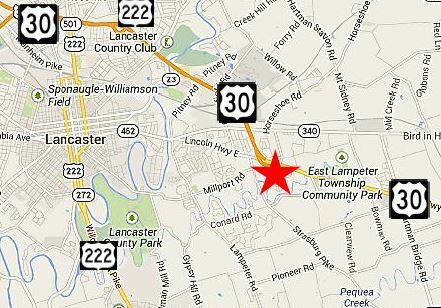 Bargain hunters throughout Lancaster County, rejoice. 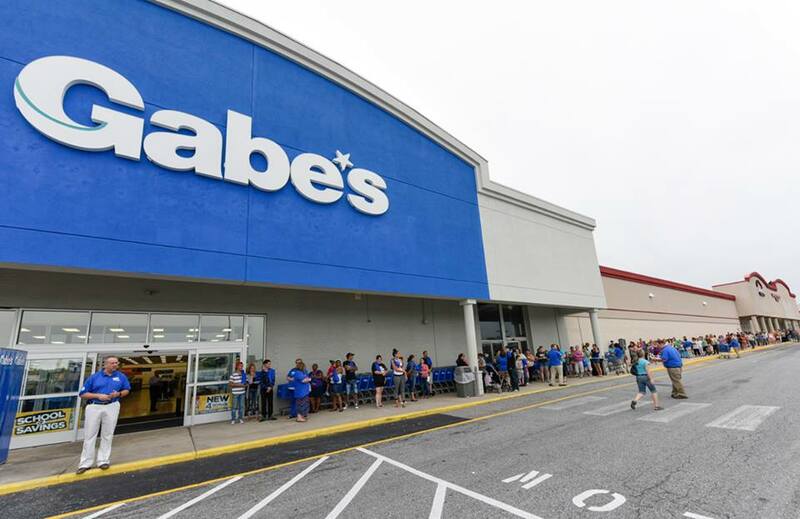 The ribbon was cut on Saturday, July 18, 2015 to officially open the new discount retailer, Gabe’s, at East Towne Centre Shopping Plaza along Route 30. The 41,000-square-foot store now takes over half of the space where the Kmart that closed in mid-May had occupied for 38 years. The Lancaster location is one of 52 other Gabe’s stores operating in 9 states, including Delaware, Ohio, Virginia, Maryland, and Pennsylvania, making this Gabe’s the 13th Pennsylvania location. Gabe’s on opening day. Store Hours are 9 a.m.-9 p.m. Monday through Thursday, 9 a.m.-10 p.m. Friday and Saturday, 10 a.m.-8 p.m. Sunday; 800-458-6546. Pennmark’s own construction manager, Chris Cafiero was present at Gabe’s opening day. He was pleasantly taken aback by the turnout; “I must say, I have never seen so many people in a store. The parking lot was jammed packed…traffic at one time was lined up back to Burlington Coat Factory waiting to get out of the parking lot.” This turnout is a reflection of Gabe’s impressive, nearly century-old style of merchandising to attract customers. Gabe’s has invested an impressive $2 million toward its new store and is known for massive selections of the latest styles and fashions sold at highly discounted prices. The company went through a rebranding in 2013 and changed its name from “Gabriel Brother’s” to “Gabes,” but what hasn’t changed is what makes them stand out from other off-price retailers; Consistently changing inventory. Gabe’s gets new merchandise at least twice a week, so their stock is always being updated with new designer accessories, clothing, housewares, furniture, electronics, bath and beauty products and much more. The entire complex at East Towne Centre where Gabe’s resides consists of approximately 325,000 square feet of commercial retail space. 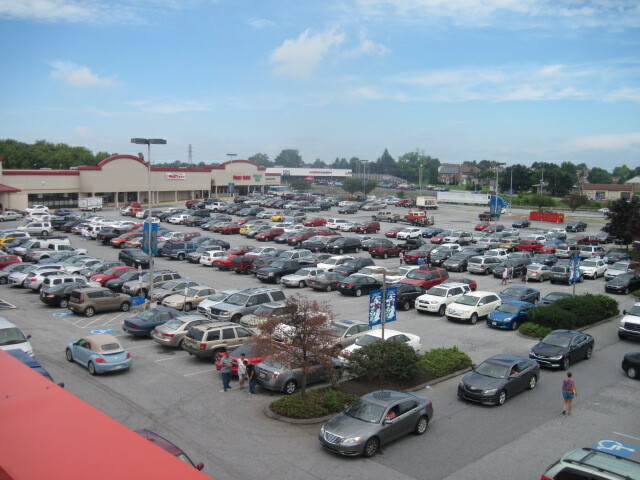 The center is also home to a diversity of tenants , including Burlington Coat Factory, Dollar Tree, Red Lobster, Harbor Freight Tools USA, Manor Buffet, and Penn National. Soon to be neighboring Gabe’s is fellow discount retailer, Ollie’s Bargain Outlet, who has signed a lease for the 36,000-square-foot space between Burlington Coat Factory and Manor Buffet. The new Ollie’s is lined up to open before November, taking over a spot where Staples used to occupy four years ago. Gabe’s new store has already brought in more than 100 new employees to the complex, and with Ollie’s on the way, the East Towne Center is set up for a refreshing new look. View from the roof looking down at the parking lot. Gabe’s opening day, July 18th.